If you enjoy exploring the outdoors on foot, you’re in luck, because Georgia offers some of the most diverse and scenic hiking trails around. You’ll find a new surprise at each and every bend. Challenging backcountry trails are found at Amicalola Falls (Appalachian Trail access), Black Rock Mountain, Cloudland Canyon, F.D. Roosevelt, Fort Mountain, Providence Canyon, Unicoi and Vogel. Primitive camping is allowed with advanced reservations. Hike to the Len Foote Hike Inn at Amicalola Falls and spend the night. Pack it in; pack it out. Paved or hard-surfaced trails suitable for wheelchairs and strollers are found at Amicalola Falls (great waterfall view), Cloudland Canyon (parking lot to overlook), Mistletoe (rubber surface), Fort Yargo (Birdberry Trail), Panola Mountain (hilly), Red Top Mountain (short loop), Skidaway Island (some sand and roots), Stephen C. Foster (Okefenokee boardwalk) and Tallulah Gorge (old railroad bed). Nearly every state park trail provides an opportunity for children to burn off energy and explore nature. A few top choices are at Fort Mountain (lake loop), General Coffee (farm animals), Reed Bingham (gopher tortoises), Skidaway Island (fiddler crabs), Sweetwater Creek (follows a large creek) and Watson Mill Bridge (covered bridge and shoals). Stretch your legs and your mind on trails at state historic sites. 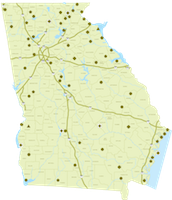 Good choices are Etowah or Kolomoki (Indian mounds), Jarrell Plantation or Hofwyl-Broadfield Plantation (farm buildings), New Echota (Cherokee capitol), Pickett’s Mill or Fort McAllister (Civil War), Fort Morris (Revolutionary War) and Fort King George (Colonial Georgia). At 729 feet, Amicalola Falls is the tallest cascading waterfall in the Southeast. Cloudland Canyon has two waterfalls that tumble over layers of sandstone and shale into pools below. Guests can also discover these wonders of nature at Fort Mountain, Black Rock Mountain, High Falls, Tallulah Gorge and Vogel state parks. Anna Ruby Falls is located just outside Unicoi State Park & Lodge. To begin or expand your hiking adventures at Georgia State Parks, join the Canyon Climbers Club and experience some of the system’s most spectacular landscapes.